Osteoarthritis is one of the most common forms of arthritis that affects the knees. Treatment for this condition usually involves getting a cortisone shot in knee. Injecting cortisone into a specific part of your body helps relieve pain and inflammation. Cortisone shots are usually injected into joints such as the ankle, hip, elbow, shoulder, spine and wrist to relieve pain. Cortisone is a man-made steroid that mimics the effects of cortisol, but lasts longer. Cortisol is a naturally occurring hormone in the body that is released by the adrenal gland whenever you are stressed. When you are injected with cortisone, it relieves inflammation. It is normally administered together with local anesthetic to provide instant pain relief. Steroid injections are normally given for knee pain when all other options (such as physical therapy and medication) have failed. What Is a Cortisone Shot in Knee For? 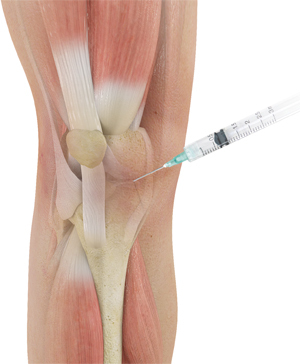 Cortisone shot in knee can be used to soothe knee pain resulting from various causes. This includes tendonitis, bursitis, gout, cartilage tears and arthritis. It is one of the best ways to relieve pain and recover function. However, a cortisone shot in knee is not a permanent cure. It is best to incorporate the injection into a multifactorial treatment program which may include medication, exercises, walking aids and knee braces. Cortisone "flare" reaction. This happens when the corticosteroids you’ve been injected with crystallize in your joint. This only happens to 2% of people who received the injection and is usually very painful. You can treat the flares with icing and it will resolve after 12 to 48 hours. Soft tissue damage. This is where the cartilage softens and tendons weaken in the afflicted joint as a result of the cortisone shot. This usually happens when you receive frequent injections and it can be permanent. High blood sugar. If you are diabetic, a cortisone shot in knee could lead to a spike in your blood sugar level. For this reason, your doctor should monitor your progress for 24 to 48 hours after administering the shot. Hypercortisolism. Also referred to as Cushing's syndrome, this condition occurs due to over-exposure to cortisol. It can lead to a round-shaped face, upper body obesity, trouble healing, increased bruising, excessive hair growth, weak bones, irregular periods in women and fertility complications in men. If this side effect occurs, you will have to reduce the use of cortisone gradually and adjust your dosage. Infection. Getting an infection at the site of the shot is uncommon, but it could occur if your skin is not properly sterilized prior to receiving the injection. The injection works fast. You should feel better within 1 to 2 days after getting it. The effect only last for a short time. The shot is not a permanent solution. It will only last around 6 to 12 weeks. They are not to be used frequently. A cortisone shot in knee should only be used 3 times a year at most. The efficacy dwindles with every shot. The second time won’t be as effective as the first time. Before the procedure you might be asked by your doctor to change into a gown. You will then be made to sit or lie in a position that makes it easier for them to insert the needle into your knee. The first thing the doctor will do after you’re ready is to clean the area around the injection site. They may apply an aesthetic spray to help numb the area. In some cases, the doctor may use ultra sound or fluoroscopy (a type of X-ray) to monitor the needles’ movement in your body. This enables them to hit the right spot. When the needle is inserted, you will feel some pressure. Should you feel any discomfort, let your doctor know. It is at this point that the medication is released into the injection site. The cortisone shot is often administered along with a corticosteroid medication to help relieve inflammation and pain over time. It also includes an anesthetic to provide instant pain relief. Keep the injection site protected for about 2 days. Avoid straining or stretching the joint. Say off your feet whenever you can and avoid heavy lifting. You can relive pain at the injection site by applying ice. Watch out for signs of infection including redness, increased pain and swelling that lasts for more than 2 days. While you might feel great after getting a cortisone shot in knee, you still need to address the underlying biomechanics of the knee. Medications and injections are only meant to give you an opportunity to get into a structured exercise program. This will help to unload the knee, and prevent the recurrence of pain and inflammation after you have stopped taking medication.